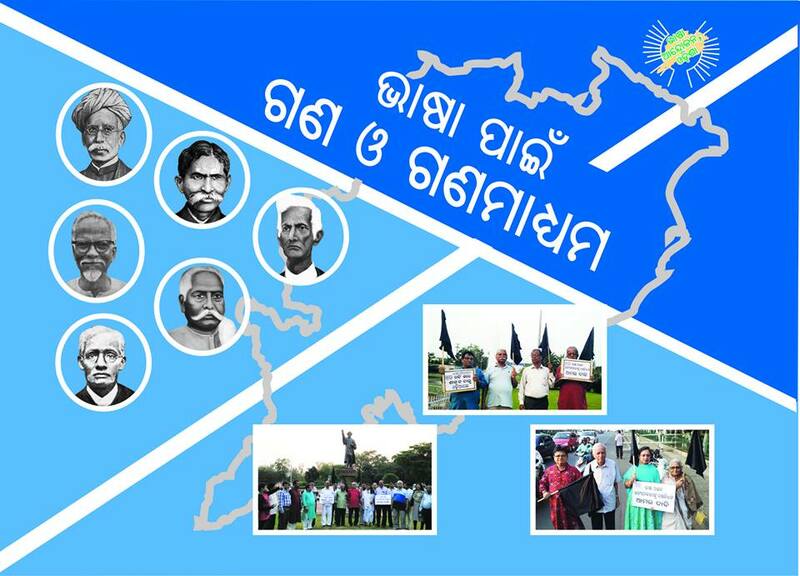 Come 11.30 this forenoon, the first of its kind documentation on the world’s unique movement for governance of the Motherland in the mother tongue of the people, a printed presentation to contemporary history, will be released in the auditorium of Institute of Engineers, Bhubaneswar. It is captioned ‘Bhasha Pai’n Gana O Gana Madhyama’ (The People and the Press in support of the Mother Tongue). It depicts, according to its publisher ‘Shabdasparsha’, the pictorial activities of “Bhasha Andolan, Orissa” along with guiding articles published in print media. Bhasha Andolan is a modified Gandhian movement conceived and formulated by ORISSA MATTERS Chief Subhas Chandra Pattanayak (Chairman of the movement) and executed by dedicated people of Orissa under the leadership of Subartta editor Pradyumna Satpathy (President), Media Consultant Pabitra Mohan Maharatha (Convenor) and columnist Tusarkanta Satpathy (Coordinator). Journalist Sagar Satpathy is one of its founders. Four eminent Oriyas with ‘Black Flags’ and placards in their hands march silently on the chest-zone of Orissa Government everyday at 5pm from the State Assembly , where the statue of the late lamented Chief Minister Nabakrushna Chowdhury reminds of the man, who had given Orissa the legal right to be governed in Oriya by framing the Orissa Official Language Act in 1954 and proceeds to the statue of Kulagaurav Madhusudan Das erected in front of the Governor’s House, without contravention of any law and disturbance to the flow of traffic. Madhu Sudan Das, popularly called with reverence as Madhubabu, was the main force behind creation of Orissa as the first linguistic province of India. The silent ‘Black Flags’ of ‘Bhasha Andolan, Orissa’ have become the symbol of liberation war of the people of Orissa, who are perishing under an administration that runs in English Language, despite English not being a constitutionally valid language. The Oriyas are a very ancient nation with a rich vocabulary recognized as such by the First Linguistic Survey of India, which had unambiguously reported that, “neither Telugu nor Bengali nor Hindi can vie with it”. This unique “Finest Race” (Gandhiji had thus described the Oriyas, while supporting their movement for amalgamation of all Oriya speaking tracks) was the first to have raised a battle to oust the British from their soil. The British was afraid of getting ejected out of the soil, where it had not only saw the matchless valor of its warrior class, but also had the first experience of non-cooperation movement. The British Judicial Officer – who was in charge of prosecuting the rebellious Oriyas – W. Forrester had rightly reported to the British authorities that the “disposition” of the Oriyas is such that “neither Military nor Police can suppress” their challenge to the British. The same “disposition” is witnessed in the ‘Black Flag’ march of the Bhasa Andolan. The attached poem of Subhas Chandra Pattanayak, author of the movement’s anthem ‘JANMANI JANMANI BHASHA JANANI’ is meant to warn the government of anglocised mentality and anti-Oriya attitude about what to happen if the movement’s demand for punishment to whosoever contravenes the Orissa Official Language Act and subjects official business to English language, is not fulfilled.